If you’re currently dealing with a chipped, cracked, broken, decayed, or missing tooth, know that you no longer have to go through life with an incomplete smile. 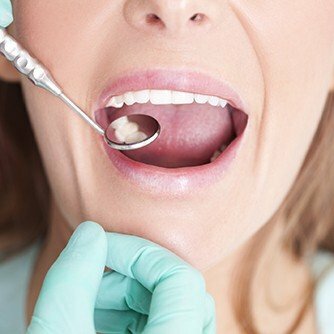 At Monet Aesthetic Dentistry, Dr. Metzger and our team use the latest techniques and materials to help even the most compromised smile look like new again. Combining science with her artistic touch, Dr. Metzger will make your dental problem seemingly disappear, leaving a beautiful set of teeth in its place. If you’re ready to enjoy your full smile again, we’re ready to help, so give us a call today. Whether a tooth has developed a large cavity, been damaged in an accident, or gone missing altogether, crowns and bridges can come to the rescue. These are two of the most commonly used restorations in all of dentistry, and at our practice, we custom-design each one so that it’s perfectly suited for every patient. In the end, no matter what your smile needs to look and feel its best, Dr. Metzger will be able to provide it, and only you and her will notice that you’ve had dental work. Minor problems like small cavities can be fixed with fillings, while larger ones can be addressed with crowns. However, there is a middle ground between the two treatments: inlays and onlays. Also called “partial crowns,” they enable Dr. Metzger to repair teeth while preserving as much of their natural structure as possible. Inlays help restore the interior of a tooth, while onlays restore both the interior and the cusps (biting surfaces) of a tooth. A tooth-colored filling crosses the boundary between cosmetic and restorative dentistry. As the means for repairing tooth decay, it is restorative. However, because a tooth-colored filling is perfectly matched to the existing shade of your enamel, it is also cosmetic. 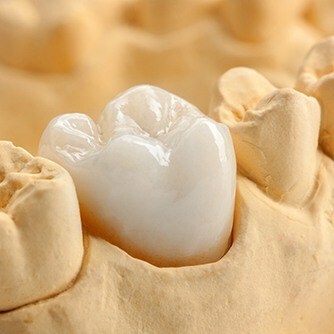 Only you and Dr. Metzger will know that you’ve had a cavity filled when she uses a composite resin material that is both strong and natural-looking. For patients dealing with extensive tooth loss, dentures offer a quick and effective way to bring their smile back to its former glory. Modern-day dentures are smaller, sleeker, and more comfortable than ever. When they’re designed by Dr. Metzger, they look perfectly natural as well. Partial dentures can fill in the gaps in a patient’s smile like the missing piece of a puzzle, while full dentures can instantly replace an entire row. We can even provide patients with implant-retained dentures so they can enjoy the most secure and longest-lasting fit possible.